Record Nations is partnered with top dental records scanning companies throughout the country that can quickly and accurately scan all your paper records and implement them into a viable management system. Dental records scanning makes it easy and more cost-effective for your dental records management system. Let our experts take control of the project instead of hiring someone onto your payroll to handle the scanning and storage of your records. 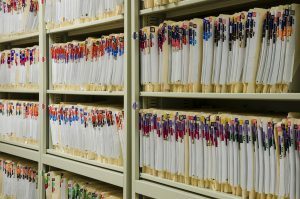 We can also help you store records you might not access regularly but still have to retain with our Dental Records Storage service. How Does Our Dental Record Scanning Work? The entire process is secure and HIPAA compliant. Once your scanning is completed, we have options to securely dispose of the physical copies that industry-standard safe or off site facilities to store them for retrieval when you need them. Get Free, No-Hassle Quotes on Dental Record Management Today! Record Nations works with a network of local dental records scanning professionals who have experience working in the dental and medical industry for decades. We offer free quotes on the top scanning companies based on your location. To get started, fill out the form to the right, or give us a call at (866) 385-3706. Within minutes of receiving your request, you will have free quotes from experts in your area that can help you find the right scanning and storage services for your practice.